This section of your account is to encourage to use Zulu eDM to the best of its ability and to make sure that you are doing all you possibly can to manage your database marketing efforts the best way possible. When you first create your account this section may look a little like this below. What you want to do is create Profiles, Web Forms and Groups for your database so that you can manage your communications effectively. Zulu eDM will automatically create a mailing list and contact us form for you to use on your website - you can modify these if you wish or use them as they are. 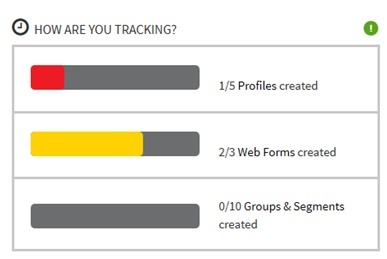 These are the groups & segments you will be sending to so you should create as many as you need to ensure you are sending targeted communications. 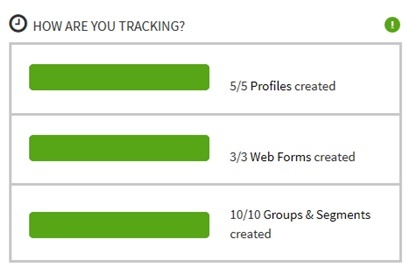 Below is an example of a client account that has completed all of these areas within their account, and are managing their database successfully.